ग्वाल्हेरला बुवांच एक गाण ऐकल्यावर श्रोते - रसिक आणि गवयी - अन्तुबुवाना म्हणाले " बुवा आपले चिरंजीव दोन दिवसांपूर्वी आले होते आणि असे उत्तम गायले कि काय सांगावे! अप्रतिम गाऊन गेले." अन्तुबुवानी बुवांना पत्रातून लिहिले " तुझी सर्व गायकांनी हृदयापासून तारीफ केली. ती ऐकून धन्य झालो. मी तुला शिकवले त्याचे चीज झाले! " बुवांनी ते पत्र जपून ठेवले. Paraphrased in English. (Not a literal translation) In Gwalior on listening to Gajananbuwa in his vocal concert many music lovers and singers remarked to Antubuwa that his son's performance was matchless - without an equal! Antubuwa in his letter to his son wrote " I was so happy to hear so many singers admiring your singing from the bottom of their hearts. I got my reward of being your Guru! " Gajananbuwa securely preserved his father's letter. This fascinating event is narrated by Shri Baburao Joshi of Kolhapur. Baburao was the president of the famous Deval Music Club in Kolhapur when this event took place. What follows is a brief paraphrased version in English of Baburao’s original piece in Marathi. “A programme to pay reverence and to honour the legendary actor singer Bal Gandharva for his immortal contribution to Marathi Theatre and Music took place in the Palace Theatre in Kolhapur. The princess of the Kolhapur State Taraabi Saheb was the chief guest. The organisers of the event had also arranged a violin recital of Pandit Gajananbuwa with an accompaniment on Tabla by Ustad Thirakhwa Khan Saheb. Bal Gandharva was one of Buwa’s heroes. Buwa started the recital with Raga Mulatani. Buwa was in an excellent mood and spirit to pay his own respects to Bal Gandharva. Buwa’s Mulatani on Violin and khansaheb’s accompaniment on Tabla overwhelmed the audience with joy! No sooner the clapping noise of the audience was over than Buwa played the (मुखड़ा) opening notes of the landmark song ‘Narawar Krishna Saman’ (नरवर कृष्णा समान). Not only did the lyrical, playful and romantic rendering of Buwa’s violin almost mesmerised the audience but Bal Gandharva himself spontaneously uttered 'वा वा , देवा' clapping his hands!" You may have already listened to Buwa's Narawar Krishna Saman on this website. Here is a link to Bal Gandharva's original presentation of 'Narawar Krishna Saman'. The excerpts from Baburao Joshi's original piece in Marathi are given below: "बालगंधर्वांचा सत्कार झाला.व्यासपीठावर आले गजाननबुवा आणि थिरखवा खानसाहेब. वाजवायला सुरवात झाली आणि साभागराचे वातावरण क्षणात पालटले....बालगंधर्व श्रेष्ट नटसम्राट दाद द्यायला हजर! ...बुवानी नरवर कृष्णा समान या गीतावर गज फिरवला आणि प्रेक्षकांची अशी उत्स्फुर्त दाद मी कधीच पाहिली नाही! बुवानी धमाल आणि कमाल केली! बालगंधर्वांची श्रवण करता करता ब्रह्मानंदी टाळी लागली आणि उदगार आले " वाहवा देवा" .... पद संपल. कार्यक्रम संपला . पण बुवा आणि खानसाहेब यांची जोड़ी मनातून हलली नाही! " A similar event took place later in Pune. The location was the N M V High School. On the grounds of the school a stage was built to celebrate Master Krishnarao's 60th Birthday. Master Krishnarao's friends, fans, and disciples had organised a three day festival of music. Musicians from different parts of India participated in the celebration. Among them were Bade Gulam Ali Khan Saheb, Ustad Ajamat Hussain Khan Saheb, Gajananbuwa, and Ustad Thirakwa Khansaheb. Gajanabuwa was an admirer of Master Krishnarao. When Buwa's turn came to play violin he started his recital with Raga Jogkans. As usual Buwa's extempore rhythmic work (लयकारी) and Khansaheb's equally ingenious accompaniment more than pleased the listeners. Before Buwa started to play the second piece, Master Krishnarao who was sitting in the front made a request (फरमाइश) to Buwa. Surprise! Surprise! Master Krishnarao asked Buwa to play 'Narwar Krishna Samman' (नरवर कृष्ण सामान). To witness this extraordinary concert was once in a life time opportunity! Buwa's violin was singing the tender and loving poem about Rukimini falling in love with Krishna. Master Krishnarao and other celebrity musicians were showering the spontaneous responses (दाद) to Buwa's performance! Here was the live music making at it's best where the musicians and the listeners became one! 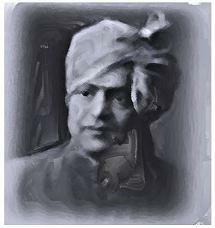 Yadu Mani Sadana Please check out the link above to listen to the feast of master Krishnarao's 'take' on another famous song 'Yadu Mani Sadana' a hit song of Bal Gandharva. This song was also a favourite piece in the rich repertoire of Gajananbuwa's violin music. The significance of these two events is not easy to appreciate for many of us. Here was Bal Gandharva one of the greatest singers of all time who had sung this song ‘Narawar Krishna Saman’ thousand times on the stage. He had almost ‘lived ‘this song! Here was Master Krishnaro a friend, a colleague and a Guru Bandhu of Bal Gandharva. He had acted with Bal Gandharva and would have listened to 'Narawar Krishna Samaan' thousand times. Ask the question: What was it that Bal Gandharva and Krishnarao found in Buwa’s rendering of the song that so much appealed to them? Only Bal Gandharva and Master Krishnarao would know the answer to this question. However let us venture to guess or speculate an answer : Music is an abstract art form. Through Music a musician may be searching some kind of experience that transcends the material world, an experience that is spiritual. That search may be for the ultimate beauty, ultimate truth, God or Brahman or whatever you may call 'it'. Geniuses like Bal Gandharva and Master Krishnarao perhaps did get that 'feel' of spiritual experience in their own music making. It may be that their own experience of singing a song like 'Narawar Krishna Samaan' mirrored in the act of listening to Gajananbuwa's rendering of this song. May be they re-experienced, relived that 'feel' of the' transcendental' in Gajananbuwa's music! For Gajananbuwa to receive such an accolade from Narayanrao and Master - as Buwa often used to refer to Bal Gandharva and Krishnarao-must have been one of the finest and satisfying moments in his life. There cannot be a better evidence than these two concerts described above to support a value judgement that Gajananbuwa was probably the Greatest Violin Player if such an evidence is needed at all! We see here an interesting chain of connections. Ustad Alladiya Khan Saheb - the Mount Everest of Hindustani Classical Music had applauded Bal Gandharva's Gayaki. Bal Gandharva and Master Krishnarao applauded Gajananbuwa's singing violin. 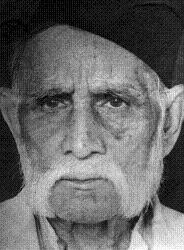 Buwa was a disciple of Alladiya Khansaheb's disciple and son Ustad Bhurji Khansaheb. Bal Gandharva and Master Krishnarao were disciples of Alladiya Khan Saheb's disciple Pandit Bhaskarbuwa Bakhale! For most music listeners whatever their level of competence and knowledge in Music there clearly is some indescribable magic in Buwa’s rendering of ‘Narwar Krishna Saman’. That magic is as fresh today as it was then. In the year 1950-51, an all India music conference was organised in Bharatiya Vidyabhavan in Mumbai that was broadcast by All India radio. Gajananbuwa was invited to play Violin and so was Ustad Thirkhwa Khasaheb to accompany Buwa. Another well known Tabla player of Banaras Gharana the well known Pandit Samta Prasad was also an invitee to the conference. Pandit Sampta Prasad having heard that Thirkhawa Khansaheb was to accompany Gajananbuwa, asked the AIR management "why am I not accompanying Gajananbuwa?. He is such a well known musician. Why only Thirkhawa Khansaheb should accompany Gajananbuwa?" (गजनानबुवान्च्याबरोबर फक्त उस्ताद थिरखवाच का?) After some discussion between Buwa, AIR management and Thirkhawa Khansaheb, Khansaheb suggested that both Samta Prasad and he shoud accompany Buwa. In the end it was agreed that both the Tabla masters would individually accompany Buwa. Rarely two great Tabla players were so eager to accompany a great instrumentalist! Here is a real treat for you. Gajananbuwa plays Raga Mulatani and Khansaheb accompanies him on Tabla, a live performance. In their younger days Pandit Gajananbuwa and Pandit Ravi Shankar participated in a JUGALBANDI in Mumbai. A detailed and interesting article is written by Mr Gokhale in Marathi....click to read the article. Buwa was about ten years old. He had an opportunity to listen to the singing of the Great Ustad Alladiya Khan Saheb. Khansaheb’s concert was arranged in Sangali by his Aurvedic Doctor on the occasion of Lord Ganapati Festival. Buwa went to this concert with his father Antubuwa. In his autobiography Buwa tells us that he was much too young to understand Khansaheb’s music. But he liked what he heard. The concert took place in the morning. Khansahbe sang Raga Desi and few other Ragas. Buwa told his father that Khansaheb sang beautifully and that he enjoyed Khan Saheb’s music. Antubuwa was surprised to hear such remark from young Gajanan and was pleased that Gajananan at such a young age appreciated the beautiful Gayaki of Khansaheb. “ Surely he is already a musicophile!” thought Antubuwa. Little did Buwa or Antubua know then that one day Buwa would be a disciple of Alladiya Khan Saheb’s son the great Bhurji Khan Saheb, would master the Jaipur Gayaki and be one of the foremost singers of Jaipur Gharana!